The world’s first “smart carry-on” lets you lock, weigh, and track your carry-on with your phone. Anyone who has been through the nightmare of losing a bag knows why being able to track your bag with your phone may just be the best thing ever. First of all, before you even leave for the airport, Bluesmart has a built-in scale that tells you how much it weighs and whether or not that weight is approved by the airline. It also tells you when and what to pack, so you’re fully prepared for your upcoming trip. Then, once you’re on the road, Bluesmart can be locked via an app on your phone. You can set it to automatically lock if it’s separated from you and warn you if you get too far away from it. If anyone tries to open it without your permission, the bag will tell you that too. Even going through security is easier with Bluesmart, as the bag has a special, easy-access pocket designed specifically to protect your laptop and other electronics. You can get everything out of your bag, through security, and bag in again like the pro jet setter you are. 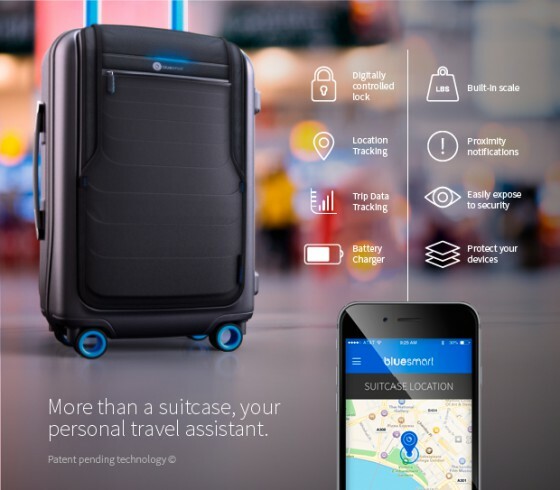 If you decide to check your bag and it disappears into the mess that is lost luggage with any airline, your Bluesmart can be tracked via the Bluesmart Network, which will become stronger as more and more people start using the bags. Two other awesome perks are the Bluesmart’s ability to act as a charging station for your electronics and to track data about your trips. With this bag, you’ll never be caught with a dead phone again! TL;DR: Shut up and take my money.